You will earn 6,611 Reward Points. Earn 1 reward point for every 1 dollar spent. US Range low height Remote Refrigerated or Freezer Base to be exclusively used under US Range Heavy Duty Cuisine Series modular tops. Stainless steel exterior front and sides. ABS interior door front and cabinet sides, and stainless steel interior top, rear and bottom. Santoprene magnetic door gasket. Galvanized steel bottom and back of base. CFC free foamed in place insulation. Removable stainless steel roller drawer assembly with self-lubricating rollers. Roller assemblies carry a 10 Year parts warranty. Standard drawers accommodate 12" x 20" x 4" deep hotel pans. HFC-404A refrigerant refrigeration system supplied with electric condensate evaporator, solenoid and thermostat. Units must be hard-wired on site. Vertically mounted blower coil on inside cabinet. 6" (152mm) mechanical section for all refrigerant, and electrical connections. Units equipped with scroll type thermometer. 6" (152mm) adjustable legs standard. 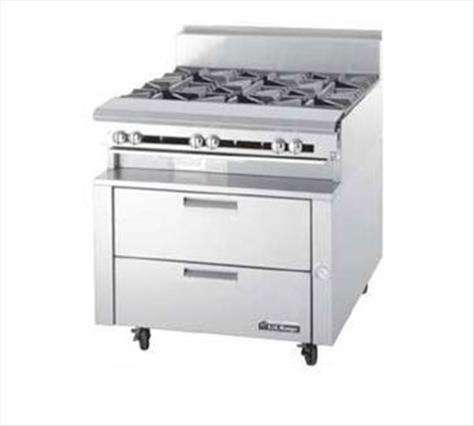 NOTE : All Bases must be order with Cuisine Series or combination of Cuisine Series Modular tops Only. Please specific when ordering modular tops if they are for refrigerated base mount. U.S. Range products are not approved or authorized for home or residential use but are intended for commercial applications only. U.S. Range will not provide service, warranty, maintenance or support of any kind other than in commercial applications.